When it comes to choosing a dorm room safe, there are several factors to consider. Perhaps the most obvious is size, since space is often limited and the safe may have to fit into cramped spaces. Of course, a safe doesn’t do any good if it isn’t secure, which is why the most important consideration is security. Traditional key lock safes can be picked, and they’re easy to open if someone can find a key. Combination lock safes offer better security, provided no one else knows your combination. A third option is a fingerprint safe, such as the Barska Biometric AX11224. It’s quick and convenient, but can it offer the security you need? Check out my review of this safe for your dorm room. The Barska Biometric AX11224 comes with the instruction manual, allen wrench, keys and mounting hardware for securing to a wall or floor, but you won’t be able to use in a dorm room. The compact Barska Biometric AX11224 fingerprint safe measures in at 16.5-by-14.5-by-7.75 inches, making it useful for the small confines of a dorm room. The body is constructed from hot-rolled silicon steel, with pry-resistant doors and concealed hinges. At the front of the safe is a biometric fingerprint scanner. The interior of the safe is lined by a protective floor mat to prevent damage to valuables. While not as nice as the padding provided with Stack-On PS508 the padding, it should be sufficient to keep your items from scratching on the floor of the safe. The Barska Biometric AX11224 is the smallest of the laptop safes I tested. While there is enough room inside of the safe for my 16″ laptop, getting it through the door is a bit tricky as I had to insert it diagonally to get it to fit which isn’t a big deal but is something to be aware of. The diagonal measurement is 16″ but actual width is 13.25″. Be sure to measure your laptop before buying this safe. The Barska Biometric AX11224 is operated by a biometric fingerprint scanner at the front of the safe. The scanner is able to scan and store up to 30 unique fingerprints. For ease of use, it’s recommended that each fingerprint be scanned and stored at several different angles. When a fingerprint is scanned in an attempt to open the safe, advanced bio-technology quickly and accurately compares it against the fingerprints stored in the safe’s memory. If a match is found, the scanner activates the motorized deadbolt locks to unlock the door. A set of override keys is also included in order to manually open the door. Should you lose a finger or the batteries run out of juice, there is a backup key. Unlocking the safe is pretty straightforward. The batteries are held behind a panel of the door of the safe. You will need a phillips screwdriver to open it. 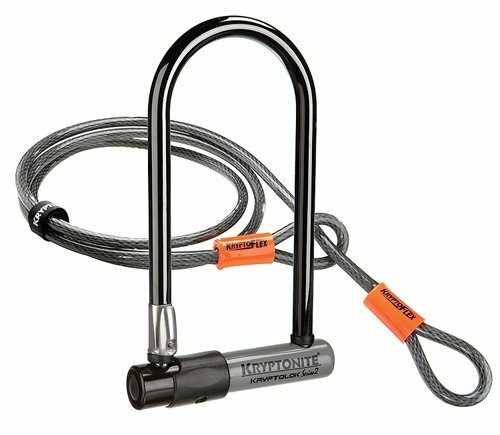 To secure the safe you can use Master Lock 1519D Combination Cable Padlock. The end of the cable that inserts into the padlock is a bullet shape that threads easily through the back of the safe, around a fixed object and back through the safe where it is inserted into the padlock. I kept the sticker with combination on the back of the padlock, just in case I forget the combination and since it is locked inside the safe, nobody can see the combination. The Barska Biometric AX11224 is quick, easy and convenient. Rather than fumbling around for keys or trying to remember a lengthy combination, you carry the key right at your fingertips. The fingerprint scanner is accurate and offers excellent security, and the ability to store up to 30 fingerprints offers versatility for multiple users. Scans can also be taken of the same finger from multiple angles, making it easier for the safe to recognize the fingerprint without worrying about precise placement. 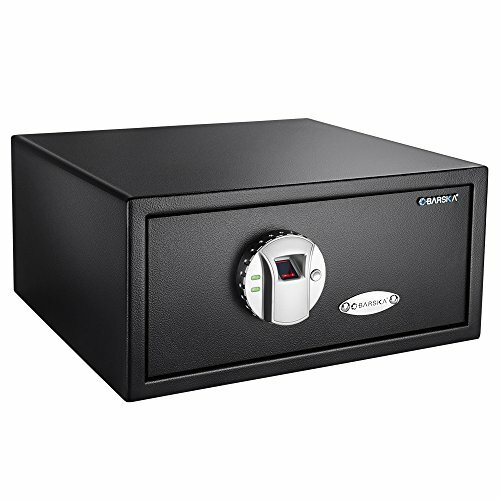 The safe offers plenty of storage space despite its relatively compact size, and the body is sturdy and reasonably well-constructed. However, the Barska Biometric safe does present some issues. Although the fingerprint scanner works well and offers solid security, it must be wiped after every use to prevent unauthorized users from utilizing residual fingerprints. The body of the safe, though solid enough to deter a casual thief, will not be an impediment to a determined and well-equipped criminal. At 25 pounds, the safe is also light enough to be carried off if not properly bolted to the floor or another solid surface. Nonetheless, the Barska Biometric AX11224 offers an excellent blend of security and convenience for a dorm room situation. I felt the Barska Biometric AX11224 was this highest quality laptop safe and had the very cool fingerprint reader, it also had the highest price tag. Some points were knocked off because the narrow door opening made it a bit difficult to store my laptop, which may not be an issue for you.